For those planning a CD release of their music this article will explain what a DDP is. DDP stands for Disc Description Protocol, it is a file format which specifies the audio and data content of a CD or CD-R in place of an actual physical CD-R.
DDP is very widely accepted but it is best to check with your CD replication or duplication plant if they can accept a DDP. Usually they will want it sent using an online file transfer service or sent to them direct to their I.T. servers using FTP (File Transfer protocol). I can perform either of these on your behalf if required. When I produce a DDP I will create a “DDP Player” which the client can use on their mac or PC to hear the content of the “disk”. This is much faster than sending a CD-R pre-master via post and also safer as there is no physical disk to get damaged. You can also see all the CD-TEXT and ISR Codes on the disk. Just check your replication/duplication plant can accept DDPi. A DDP is a data only file format that holds the entire contents of a Red Book CD with audio, spaces, ISRC CODES, Barcode (UPC/EAN). It also contains CD-TEXT such as track names/artist/release title and can be accepted by most CD duplication/replication plants. For delivery of a DDP fileset I require the Username, Host and Password from the FTP server at the plant if relevant. Or their incoming work email address where they accept DDP deliveries using an online file transfer service. Download the zipped DDP file and player, unzip the folder and you can see the folder inside called “Player” Double clicking on the relevant PC or Mac player. Wait for around 15-20 seconds and then you will see the tracks listed in the DDP player GUI along with other details on the disk. You can review and check CD-TEXT, ISRC codes, EAN/UPC Barcode, release title, artist etc. on the disk and the spacing. You can listen to your music in the DDP from start to end using the transport at the bottom. If there are no alternatives it is still currently possible to create CD-R disks at SafeandSound Mastering using Plextor drives and high quality CD-R media (Taiyo Yuden) however it is a little more expensive due to the extra time taken for quality control and postage. DDP is highly recommended to avoid delays. The DDP player will often be set to be able to burn reference copy CD-R’s on your computer. These are just for your own personal listening use. DO NOT USE SUCH CD-R DISKS FOR REPLICATION AS THEY WILL NOT HAVE BEEN TESTED FOR ERRORS AND COULD PRODUCE MALFUNCTIONING DISKS FROM THE PLANT. 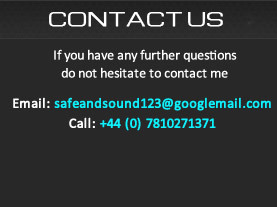 If you have any further questions about DDP or any aspect of your mastering job do not hesitate to get in contact using email or phone.